This weekend marks the end of the two-week Lunar New Year celebration to welcome The Year of the Rooster. For the first time in its 82.5-year history, the Original Farmers Market hosted esteemed Asian press professionals for an unveiling of a Rooster sculpture on its main plaza in late January. A delicious private luncheon was enjoyed by everyone (including me!) with amazing foods prepared by Peking Kitchen, Singapore's Banana Leaf, China Depot, and Farm Fresh Produce. The Market Plaza has been beautifully decorated, mostly in traditional red, while Market merchants offered meal and shopping specials to engage all of us in the celebration. enthusiastic, and hungry passerbys thoroughly enjoyed this event! Actually having taught Dim Sum classes in my early life as a Chef, I do know a little something about these irresistibly delicious little foods. 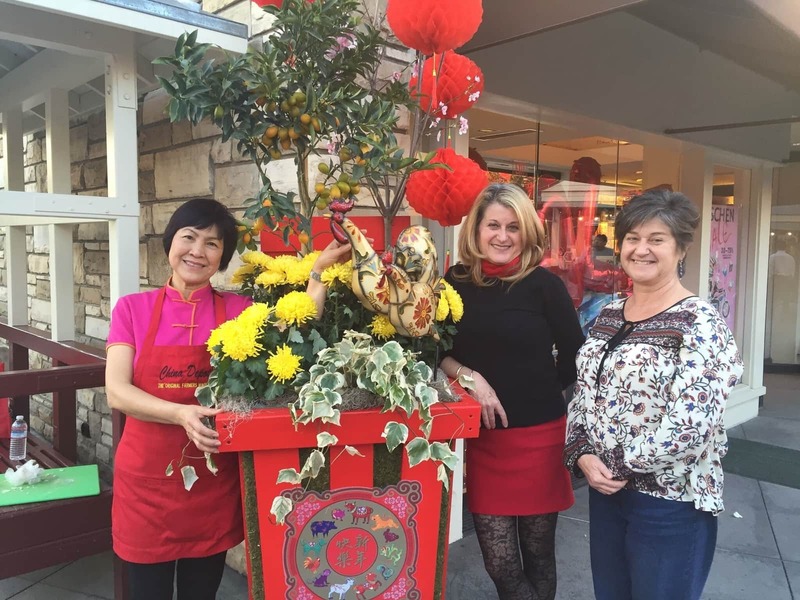 I was honored to become better acquainted with sisters Annie and Paula from the Market's Peking Kitchen, and Angie from China Depot (pictured in photo above, with Lisa and Di) to co-create this event. I was sincerely humbled when I experienced how profoundly expert these lovely ladies are, at crafting dumplings at light speed! 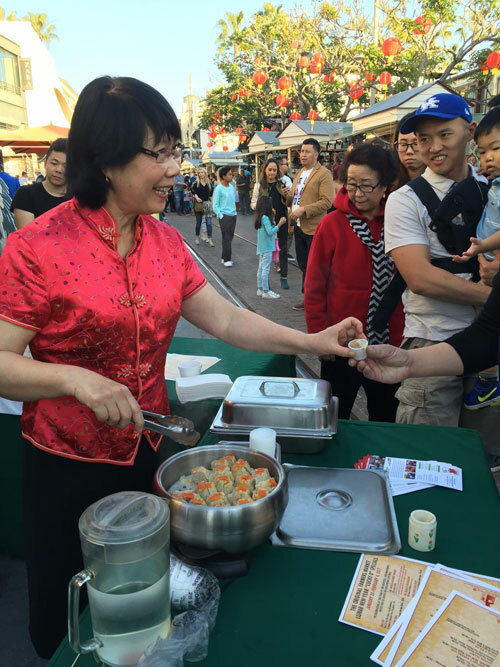 Annie (pictured, right) is the shumai artisan at Peking Kitchen. These savory little meat-filled treasures resemble money bags. Annie used ground chicken mixed with diced vegetables and corn for the filling. They were topped with ground carrot, which vibrant color represents the joy of life, prosperity, and good fortune in the new year. They were a huge hit with our guests. Pictured is Angie's contact with the crowd. 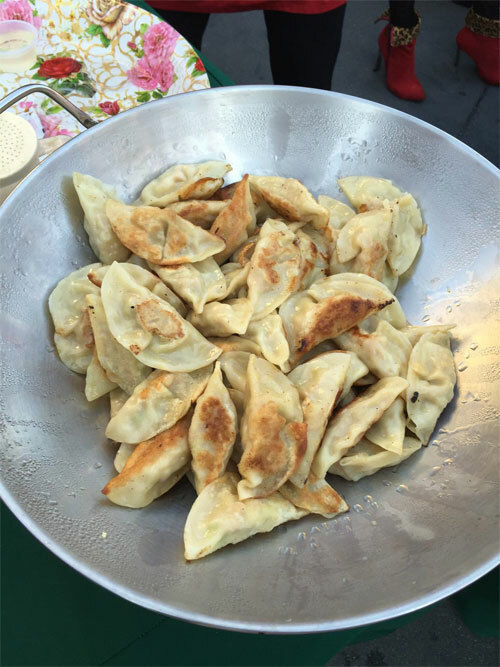 Her dumplings were filled with a simple mix of ground chicken, shredded cabbage, seasonings. Like Annie's shumai, they also vanished quickly and received rave reviews. I recommend you have a look-see at this video, which is a short, excellent lesson on preparing potstickers (with a beef-shrimp filling) and cooking them perfectly. With practice, you too will become expert at this preparation, especially since they might just become the new object of your obsession; you'll want to make them as often as possible! Here is wishing you and yours a joy-filled, delicious, and prosperous Lunar New Year of the Rooster!